Well, teaching kids comes with a lot of benefits, as it's a process of learning and experimenting for oneself with so many fun activities while teaching. I did this "crumpled paper art" recently and I must say it was really interesting and fun for children, and I really love the bright, colorful end-products! This is a very easy activity to do with 3-5 year old children with a bit of supervision. This is exactly how to create these simple and fun crumpled paper art. Let the child crumple the paper he has nicely with his hands. Then let him/her choose one single color he wants to use and let him color the outside of the crumpled paper with that color using the brush. Now let him open that paper. There will be paint on few areas on the paper and the rest will be white. So let the child crumple the paper again nicely with his hands. Now let him chose another color and paint the remaining white areas with the another color. The colors can even overlap as they will form even colorful pattern. After it's done, let the child open up the paper carefully. The colors will be spreading and mixing on the paper creating a pattern. Crumple the whole colored paper one more time nicely and open up the paper very carefully as it would be wet with the color and we don't want our art to tear. You can use a third color as well and repeat the same steps but we used only two colors as by the end of using two colors and crumpling the paper, it was too wet to use another color. Let it dry completely. Your crumpled paper art is ready! Make many with your child using different colors each time. Decorate in your child's room. It's a messy artwork but completely fun. 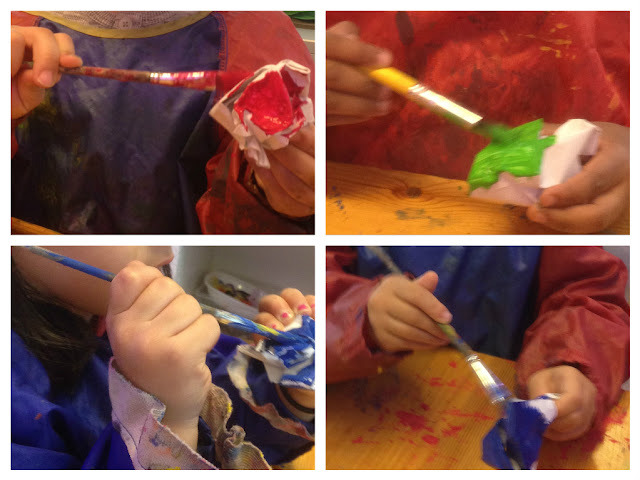 This activity, whole crumpling the papers and painting and opening up is good for improving the fine motor skills. It will be good to use colors that combine to form another color like blue+ yellow makes green so that the art would be more colorful where the colors overlap. Use an apron before you start this paint activity as it's a messy activity and children can easily get color on their clothes. Small children might need help with opening up the paper, but it's good and fun for all pre-schoolers.